The restaurant Osteria La Pergola in San Daniele del Friuli, is waiting to serve you with its gastronomic proposals based on a traditional Friulian cuisine revisited with imagination and creativity, where the careful selection of ingredients is accompanied by combinations of flavours, which are never trivial and which characterize the essence of the restaurant’s kitchen, modern and at the same time faithful to the tradition of our country. 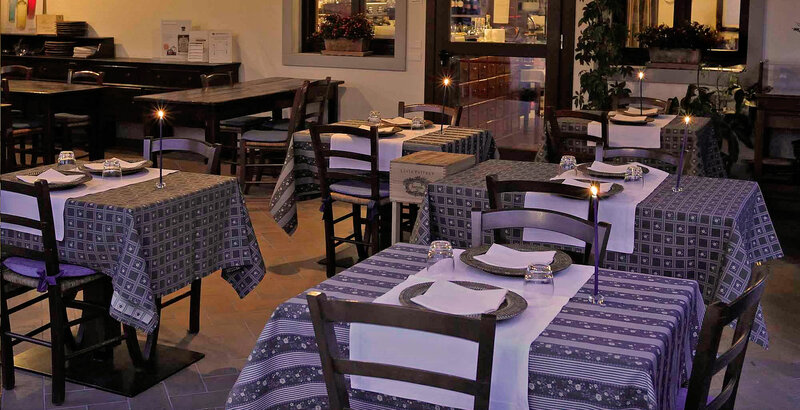 The restaurant Osteria la Pergola is known for its famous "grilled meat", prepared with care by choosing locally raised beef (which is characterized by a unique flavour and smoothness), always cooked on the large and typical "Fogolar" which, enthroned in the middle of the room, welcomes you by releasing its fragrance. In addition to meat dishes the restaurant also offers a wide variety of other dishes carefully prepared and presented with care, from which a special mention goes to homemade pasta topped with savoury game sauce or with the DOC San Daniele prosciutto ham, and a tasting menu of prosciutto di San Daniele, pickled-vegetable dip (fresh) and goat cheese with extra virgin olive oil, all accompanied by homemade bread that is served warm. Meat is not the only star of the show in dishes from the restaurant La Pergola, dishes based on fish also carve out a leading role in the menu offered to the guests. The proposed dishes, which vary each day according to the catch, are, like the meat dishes, always accompanied by appetizers and the first of the best wines of the wineries in Friuli, and find a worthy companion in fresh seasonal vegetables, bought directly from the grower, up to the final triumph of homemade desserts with recipes which are always original and imaginative. The restaurant La Pergola is distinguished not only by the quality of its food, but also for the atmosphere that welcomes the guests: the room is small but very cosy with a rustic decor with great attention to detail. The relaxed atmosphere, attentive, friendly and helpful service, willing to meet the needs of all, make the restaurant’s atmosphere very cosy, almost family-like and make it the ideal place for intimate and family dinners as well as for business meetings or gatherings.